The ninth President of the United States, William Henry Harrison served as the Territorial Governor of the Northwest Territory from 1801-1812. During that time he lived at “Grouseland,” a 300 acre estate in Vincennes that he modeled after his childhood home in Virginia that is now a National Historic Landmark. Born in 1773, William Henry Harrison was the youngest son of Benjamin Harrison, a signer of the Declaration of Independence and a three time governor of Virginia. His father wanted him to be a doctor and his early education followed this path. However, upon his death, William Henry Harrison started what was to become a long military career. He enlisted as an ensign in the Army in 1791 and served until 1798 when he was a captain. He was an aide-de-camp to General Anthony Wayne and participated in the Battle of Fallen Timbers on August 20, 1794. He was present at the Treaty of Greenville the following year. In 1798, President John Adams appointed Harrison the secretary for the Northwest Territory. When the Territory was divided two years later, Harrison became the governor for the newly formed Indiana Territory. This area included all or part of what would become Indiana, Illinois, Michigan, Wisconsin, and Minnesota. William, his wife Anna, and their children moved to Vincennes, the capital of the Territory, and constructed Grouseland in 1804. As governor, Harrison conducted a seven treaties with Native Americans from 1802- 1805 to obtain land and ensure the safety of white settlers moving west. In 1809 the Treaty of Fort Wayne involved the transfer of 3 million acres of land from the Delaware, Miami, Potawatomi, and Eel tribes in exchange for anywhere from $200- $500 per tribe. A treaty in 1805 resulted in the loss of 51 million acres of Native American land. These treaties caused consternation among Native American leaders like Tecumseh and his brother, the Prophet. Tecumseh and a group of warriors met with William Harrison on August 15, 1810 and warned that future land-grabbing would result in war. Negotiations broke up after the governor stated that the land had been acquired legally and Tecumseh retaliated by saying that he was lying. After this impasse, Tecumseh started rallying various Native American tribes and considered becoming allies with the British forces to the north who had not given up hope of one day ruling America. In response to the rumblings, Harrison put in a request to President Madison to attack the Native Americans. Eventually Madison agreed and allowed Harrison to lead the operation. The group of between 800-950 men set out for an area near the Tippecanoe River where the Prophet had a camp. On November 6, 1811 the group set up camp and began to light fires. Unfortunately for them, the Native Americans noticed the fires and in the early morning on November 7, 1811, they attacked the sleeping men and the Battle of Tippecanoe began. Despite the element of surprise, the Native Americans were unable to mount a successful attack. Later in the day, Harrison led a retaliatory campaign. Harrison’s military career continued with the War of 1812. In August of 1812, he was appointed brigadier general and led the Northwestern Army. By spring of the following year Harrison had been promoted to major general. He was active in the recapture of Detroit and, in October 1813, in defeating the Native Americans and the British in Ontario. Despite the continuation of the War, Harrison visited New York City, Philadelphia, and Washington DC to conduct a sort of victory tour where he was the guest of honor at dinners and held in high regard. In May 1814 (with the War still waging) he resigned his post and returned to Ohio at the age of 41. The second phase of his life was spent seeking political office. He served a term in the House of Representatives (1816-1819) and a term in the Ohio State Senate (1819-1821). He tried more than once to be governor of Ohio, all were unsuccessful. In 1825 Harrison finally made it to the United States Senate and served for three years. Harrison was appointed minister to Columbia and served from February 1829 to September 1829. Although approached to run as the vice presidential candidate with Daniel Webster in 1836, Harrison declined. Instead the Whigs had three candidates: Daniel Webster, Hugh White and William Henry Harrison, none of whom were strong enough to beat Martin Van Buren. Over the next four years Harrison became the first person to outright campaign for President. In 1839 the Whigs nominated William Henry Harrison, a northern Whig, for President and John Tyler, a southern Whig, as Vice President. The pair ran against Martin Van Buren and won. On March 4, 1841, Harrison gave a two hour inaugural address, one of the longest ever. Unfortunately it was a particularly cold day and he did not wear a coat or hat. He ended up contracting pneumonia and died a month later on April 4, 1841. He served the shortest term of any President and was the first to die in office. During his time as governor and the most powerful man in the territory, Harrison needed a house to display his power, wealth, and prestige. Accordingly, Grouseland was built in 1804 to be not only Harrison’s home but also his work place, and if needed, a fortress in times of unrest. The home is constructed of bricks and nails that were made on site and from lumber milled using surrounding timber. The home is twoand-a-half stories with a one-and-a-half story dependency on the back for additional space as necessary. Harrison lived here with his family until his death in 1841. The family owned the 26 room house until 1850 even though William’s term as governor ended in 1812. At other times it was used as a hotel and a part time granary. By 1860 it was a residence again. In 1909 the Francis Vigo Chapter of the Daughters of the American Revolution purchased the property. The house was maintained but due to its age and the various uses, the house was in need of a restoration. In 1949 a major campaign was undertaken by the DAR to return the house to what it looked like during the time of Governor Harrison’s occupancy. Grouseland was listed on the National Register of Historic Places in 1966; it is also a National Historic Landmark (the highest designation the National Park Service gives to historic structures). 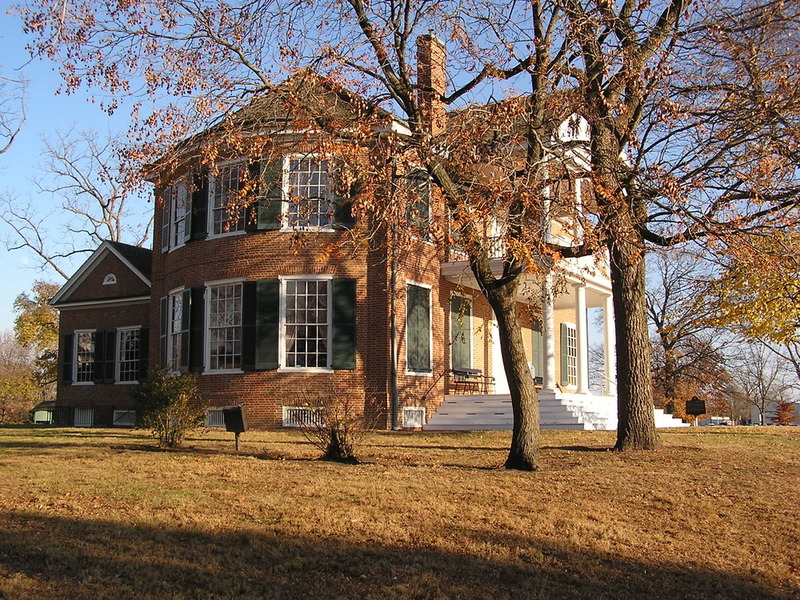 Indiana Division of Historic Preservation and Archaeology, “Grouseland (William Henry Harrison Home),” Discover Indiana, accessed April 25, 2019, https://publichistory.iupui.edu/items/show/223. Published on Jan 18, 2018. Last updated on Apr 2, 2019.